Jason Churchill is a guy with a sharp baseball mind, and nobody will ever question his networking and connections. This very info-taining article, "The Comp Has Evolved in Baseball Scouting," is worth your clickthrough and then some. "I still use the same era," said the veteran assistant GM. "I'm from the 70s and 80s, I played in that era and that's the one I know best. But for comparisons to be useful, I do have to find modern players, someone who fits the game better today. I can't go see (No. 1 Draft Prospect) Casey Mize and put down Sam McDowell or Mario Soto when our scouting director and general manager weren't born the last time they pitched. Touche'. The 1970's and 1980's were also our era, about half of us here on SSI. It's interesting, and a little self-flattering, for us to reflect on the fact that we've seen players that a 28-year-old GM did not see. ;- ) That idea got Dr. D to contemplating a little bit. There are thrown 292 pitches in a Major League game. Personally, I see almost all of them in a year; is that true for many of you? And we started watching baseball on TV in 1972 -- daily you ask? That was back in 1977. Probably in the early years, not every game was broadcast. But you multiply 40 years times 300 times 162 and you get 1,944,000 pitches. Let's trim that by 20% and we have carefully watched 1.5 million ... MILLION ... pitches. In chess Grandmaster speak, that is a whale of a lot of pattern recognition to download. So there is nothing weird about the claim that the zealous SSI Denizen, like Mo' Dawg or Bat571, has seen a lot more chess games than many of the guys talking on TV (who typically were there for the games, but not studying the sliders and changeups from the superior CF angle). If 1,000 light bulbs represent perfect baseball knowledge, then Mike Blowers has very many light bulbs on that a spectator will never have turned on. For example, Blowers, as a freakishly talented athlete, knows the myriad tiny differences and adjustments that separate a major league hitter from a AAA hitter. When he knocked in 96 runs in 1995, that was the result of jillions of lessons learned, lessons like "to look outside on 3-1 and yet protect the jam pitch, here's what you do with your front foot" and so forth. Nobody, obviously, is trying to diminish the incredible accomplishment of playing well in major league baseball. At the same time, any sensible person respects the idea that an intelligent fan has seen 1,500,000 pitches from a Bill James-educated camera angle. Would you say? Jason makes the point that scouts are in trouble if they "whisper" Randy Johnson's name in a James Paxton discussion. It will stick in the memory and for 15 years the scout will hear "that's the guy who said X ..." At SSI we don't fear for our jobs. Everybody knows we mean that the Unit is a 10 on the 1-10 scale for a Randy Johnson TEMPLATE. Chris Sale and James Paxton are somewhere on the scale of this TEMPLATE. Dee Gordon, for me, is in the Ichiro family. We can say that now that he's an outfielder. You don't comp catchers and shortstops; Bill James' original idea was, "You could trade these two players and nobody would notice much." Where is he on the sliding scale? Well, his WAR the last three years* was 3.6, 4.8, 3.4 whereas Ichiro was 5.0 like a metronome. So despite being an All-Star, so far he's only a 7 on the Ichiro scale. Isn't that something? I always thought of Nelson Cruz as the Latin Jay Buhner ... you can't walk your way off the island, brother, and Cruz doesn't wait as long in the count (less BB and K). But otherwise, I loved the comp. In the last two years has he gotten too good for that? Well, his OPS+ has gone to 150 the last three years and stayed there. Bone was a classy 130, so apparently Boomstick has spiralled up into the stratosphere where he needs another comp. for a Cruz comp based on the stats, though obviously while their counting and rate stats are pretty similar Cruz hits in a much lower offensive-output-era so his output is significantly more valuable than Canseco's was, era-adjusted. Honestly, I look at Vlad Guerrero as another close-ish comp for Cruz, though he obviously does it a little differently (more traditional kill-shot zone and about 25 BA points lower than Primy Vladdy). it's hard to find power hitters bashing 40 bombs who don't walk for a hundred points year-in, year-out, but those two (and Canseco) kinda fit that mold. Obviously I don't get to watch games from here in the Philipipnes, but Jean Segura's statline looks an awful lot like Michael Young's prime (more speed, less power, but similar right-handed BA and OBP from a MIF position--and Michael Young always reminded me of a 3/4 Edgar at the plate). Canseco's card has a bunch of 145's, 155's in the OPS+ column, as Boom's does. Canseco did have the one monster year, 170, by which players like him distinguish themselves. Had you seen that Nelson Cruz' swing-and-miss rate is 0% this year? Mitch Haniger > Larry Walker or Duke Snider (except RHB)? The Haniger comp took me more time. He does seem rather unique when you combine body type into the equation. Segura's first five full seasons (starting at age 23(): .294/.329, .246/.289, .257/.281, .319,/.368, .300/.349. They are sort of eerily alike. I've been saying that Segura reminds me of Clemente because of the slashing style, elbows and hands, line drives. But his line looks alot like him, too. In year 6 Clemente went .351/.390/.559 and he hardly slowed down from there. Segura is Clemente-lite. Visually I do see exactly what you're getting at, in the batter's box. Jean "Sudden" Segura is a SUPER talented hitter, almost a Vlad-lite in his gift for line drives off pitchers' pitches. This is a real compliment "Clemente-lite" as you know Keith... when I followed the Big Red Machine, Roberto Clemente seemed the definition of a superstar, seemed to me as a child like the Pirates' one great player. Looking at his card now, I see that Roberto had a good 9 seasons in which he had the same 3.5 to 5.0 WAR that Segura is supposed to get with his contract. Beginning in year 10 he started racking up the 7 WAR from right field. Way more than Ichiro. What a player. 'Bach and Kruk! Can I get an amen from the congregation?! That one sticks dude. I'm rolling with that one! Kruk had the unique .400 OBP talent, .380 later, but then again check out Dan Vogelbach's zone stats right now. Probly leading the league, purt' near. If Haniger is anywhere near Larry Walker then you and I are going to be two happy campers. He consistently got 20-30% of the vote on HOF ballots. Let's see, does anybody want to put together a lineup composed of each Denizen's fave comps? He doesn’t have the track record or stat line yet - but the combination of DEF, 50 PWR, tough nosed style, have me considering Guillermo Heredia as somewhere on the Jose Guillen scale. For whatever reason I always considered Jose Guillen to be a real hit man. Seemed more talented than the results he wound up with. Is that the way you remember him at all? Most definitely. Guillen always had some kind of clubhouse issue, and to be clear I don’t think Heredia shares any part of that. Considering what the kid has been through, he just seems happy to be there and has the respect of everyone. Guillen did underperform, IMO. Not sure if it was a lack of discipline or what though. It’s not the most perfect comp... But when I think of Guillen I think power arm, good HIT, good PWR. Just a solid mix. If Heredia can provide that minus the head case issues, I’m loving it. Tank hit his 4th ‘18 AAA homerun tonight. In 516 AAA career AB’s, he’s hit 35 homers. 54 BB, 156 K, 14-2 SB. He will have a MLB homer before long. Gonzo is growing on me but I have long been partial to 30+ HRs. I imagine if Marc-O does go on to become Mark Beuhrle, you're still going to be a bit wan that we lost Tank, no? Golden glove defense, left handed power, steady eddies. and for me it would be flattering to K-Swag, because Nettles always seemed to me a block of granite in the wall that was the legendary Yankee history. He seemed a representative of all the fine "supporting cast" players they've ever had. Seager as Nettles is a pretty dang cool Comp. Didn't remember that Nettles led the league in homers one year, until I just looked at his card. He was a fine player until he was nearly 40. Granite is a good way to describe him. As to Marco as Buehrle: Mark Buehrle is one of my 8 or 10 favorite pitchers ever! He never missed a start, never had a bad year, and he simplified pitching: The catcher wiggled fingers at him once and then he threw the pitch pronto (he almost never shook off a sign), totally committed. If I give him 1.1 innings in his final year, '15, then he was at or above 200 innings in 15 consecutive years and he had a losing record exactly once, 12-13 in '06. 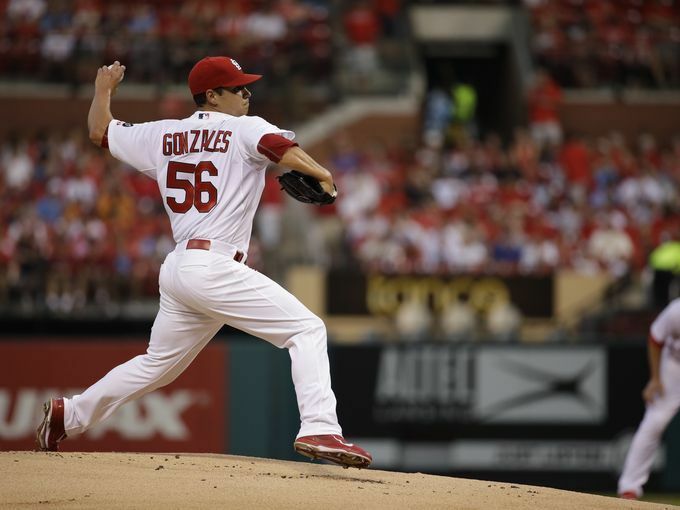 Marco Gonzales has thrown exactly 88 MLB innings, one start into his Age 26 season. Buehrle has thrown 996 by this point of his career. OK, that's a bit unfair to Marco and his elbow as the arsenal he brings is Buehrle-like, but one of the reasons I so disliked that trade is because of the concerns about Marco's durability. As I said, he's growing rapidly on me, but Tank O'Neill is a thoroughbred HR hitter with a decent BB% and can COF it just fine. I'm not whining the trade at all anymore, but were O'Neill starting in LF right now (sans Gamel), I wouldn't mind a bit. The Cubs and the Rangers have recently set the template for dealing with young guys with prodigious power: Gladly take their HR's while you let them figure out how not to whiff quite so often at the slider. That's the way I would have liked us to deal with Tank. I love the Cards organization and here's a good luck wish to Tank. Right now I'm focused on Marco and his Buerhle-like upside. If he's 175 innings of 100 level pitching, then I'm excited. I had no idea that his W/L records were so good. Now that you point it out, I see that one of his runs had 6 consecutive seasons of 12-13 wins. He was 13-10, 15-12 every SINGLE time. I liked him really well too, had him on a couple of rotisserie teams and loved the production. There was some stat about his durability ... something where he was UNIQUE in HISTORY. Wish I could remember what it was. ... maybe it was consecutive starts? ... wow, look at that IP column. Fun to look at. Perhaps he was durable in part because he was smooth and easy? Looked like he was having a catch with his sister. I bet you'd agree that Marc-O has that same oily-smooth quality. Yeah Moe, if Tank O'Neill turns out to be a Mitch Haniger type it's going to be a heavy, heavy price to pay. Cruz is a tough fit...Andres Galarraga? Here's to 44 HR in age 37 season anyway. Diaz... focusing on the slider reminds me of K-Rod, who fits pretty well in general. Leake seems to have some intangible I'll call Moyer magic. The ability to win more often than the stats say you should. Pitching to the scoreboard? This just seems like more than that. That 44 year old guy out there reminds me of a 44 year old who put up .264/.395/.319... just forget most of the 86 BB that Rose got that year. Does Paul Goldschmidt work for anyone else for Haniger? Too current? Not an OF...How about DiMaggio? I mean, Mantle was a switch hitter. When I was talking about his star rising and projecting .400 OBP potential...That is the man I found. Some of these coming years at the least. I have been calling him Mitch Mantle. Mantle had an 11 year stretch of 5.8-11.3 WAR seasons, per BR. I would love it if Hanliger could find the SB game that Pauly has, too. Here's his b-ref card. Good call on the age-arc. What do you think of Jonezie's Jose Canseco comp? Seems wild but the OPS+ fit surprisingly well. Randy Johnson for James Paxton is no stretch for anybody who watched the young and wild Unit. Of course the goal is to be 90% of the Unit for a few years. Ichiro always reminded me of Pete Rose. Let's see if he's on the similarity list... hmmm, no Rose, undoubtedly because of the Jackie-type late start. Rod Carew is #1 for Ichiro, which makes perfect sense. As noted above, I'd already given that comp. Lessee...Cruz can't be in Buhner's family Buhner never has his HIT tool. Canseco minus speed works. Juan Gonzalez also might work. Going a bit further back you've got Jim Rice in there. Cano is a tough one...can anyone think of another twenty to thirty homer, .300 BA with only a average walks, average and steady defensive middle infielders? Cal Ripken didn't have the HIT tool...Robby Alomar almost works but Cano has more power. Ryne Sandberg is a good comp, except he crashed and burned too young. Seager, in modern player comps, might be tough. Nettles doesn't work statistically...or really stylistically. Similar style would be late career Jay Bell, but that doesn't work in the twenties. Haniger is Goldschmidt in the box, but Larry Walker in the outfield. Leake is Derek Lowe...it's actually rather obvious. Gonzalez is a poor-man's Jimmy Key. Altavilla is currently Bobby Ayala, but could be JJ Putz. Is the HoF template. Jeff Kent was .289/.353/.503 through his age 34 season. Kent with +to hit in place of BBs. Maybe just not quite Rogers Hornsby in most respects, who didn't walk a ton either. Zunino has a lot in common with Piazza, who was a good game caller. There's differences as well. Bench and Berra might fit better. I don't think there's ever been anyone else like him at his position. Jackie, Morgan, Carew, all of the tip-top second basemen had a different game. Robby does too. I guess here you go to Bill James' original '70's idea; you just comp Robby to whoever the best 2B or SS or 3B was in any era. Then, the idea is the teams could swap and both teams would be fine. Visually and Results. Just a virtuoso at the plate. You can quibble but I like your first instinct here, and it makes me appreciate Robby more. Like Keith said, cool comp. B-ref.com gives Joe Torre, David Wright, George Brett (!! ), Hanley Ramirez and Ryne Sandberg. But Haniger has always--from first glimpse--been Al Kaline to me. Looks like him out there, same modest HR/maximum hit tool profile. Kaline had the advantage of 500+ AB seasons from age 19, so Mitch is never going to match that. But 6-7 WAR, .900 OPS seasons? Yeah, I think he's capable of that. It's funny. We put a "Best Bet" on the kid pretty early, but all you guys are seeing that and raising. Warms my heart. As you look at Kaline's b-ref card, you see a bunch of .530-.590 SLG despite 24-29 homers. Now THAT I can see. For me Diderot you nailed this one, a single swing of the hammer. Incredible comp. Mitch is also super classy and that's going to be my upside comp for him, a late-arriving Al Kaline. Way to rock it. That is a SUPER call, diderot. That is PERFECT! Why I didn't think of him I'll never know. White. Right. HIT. POWER. OBP. Running speed. Terrific defensive RF'er with a cannon arm. Al Kaline it IS, mate! Kaline's best seasons were behind him when the Tigers went to the World Series in 1968. One of the least appreciated Great Players in a time when most of the notice went to Willie Mays, Mickey Mantle. Stan Musial, Hank Aaron, and Duke Snider.
. . . but my goodness you guys are really hopeless romantics. Guess you wouldn't be M's fans otherwise. Z equals Yogi, Haniger : Kaline/Goldschmidt, Segura : Celmente!!!! If you could take one of our guys best years and multiply it by 12 more then maybe. I'd love to have it come true but somehow can't even dream of it happening. OTH, Vogs : Kruk is brilliant, as is Cruz Gallaraga, Heredia Guillen. Best of all is Altavilla : Ayala/Putz. That's hilarious because as everyone who suffered through the Ayala era knows, he was a born heartbreaker and Putz was fireman of the year candidate. It's like saying I think I'll go to heaven. Or hell. One of my all-time favorite (or horrifying) memories is my then teenage daughter calling me up one night whenI was working to tell me the M's had lost. This in a game in which they were well ahead. What happened, I asked. Ayala happened, she said. I like Gordon : Mickey Rivers. Yep, Gordon visually reminds me of Rivers too. A cool memory there. Just amazed there are so many people as hopeless as I am. I once saw Mickey Rivers go 5 for 5 in an afternoon game at Kaufman Stadium. He saw five pitches and hit five ground singles up the middle. Also, the worst throwing arm I've ever seen in the MLB except maybe ON THE SAME TEAM Thurman Munson who beause of an early career injury couldn't throw overhand. Pitchers neverf had to duck. When he threw to second he'd start the ball at the shortstop's head. the spirit of your comment. My bad. 5 straight ground singles up the middle, unbelievable. You see Gordon’s key 2-strike single thu the middle last game? Course for those who just joined us, runner on 3B you avoid the corners. For me Rivers was an Ichiro lite too, a Nettles type in the sense of being the kind of bread and butter cog the great teams have. Yeah, loved that hit. Did exactly what he had to do. Niether Dee nor Rivers were ever going to have the number of hits Ichiro had in his prime and neither is the plus plus defender he was. But for the price, Gordon with Segura is a steal at the top of this order that, if it ever gets healthy and rolling, could really be something.